Autumnal inspiration – the golden seasonal changes of autumn are here. October has been very mild and sunny and the vibrant kaleidoscope colours of autumn are having an impact on my recent sketches and paintings. The stunning plum and blackberry colours contrast well with the spectacular shades of moss and golden greens. 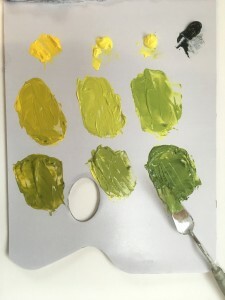 One of the best ways to mix greens is by using two colours: Paynes Gray and Yellow, I love using a Lemon Yellow. 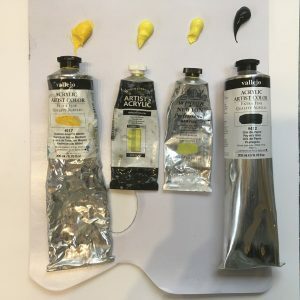 See below for a quick demonstration showing the various colours achieved using just Paynes Gray and three yellows.